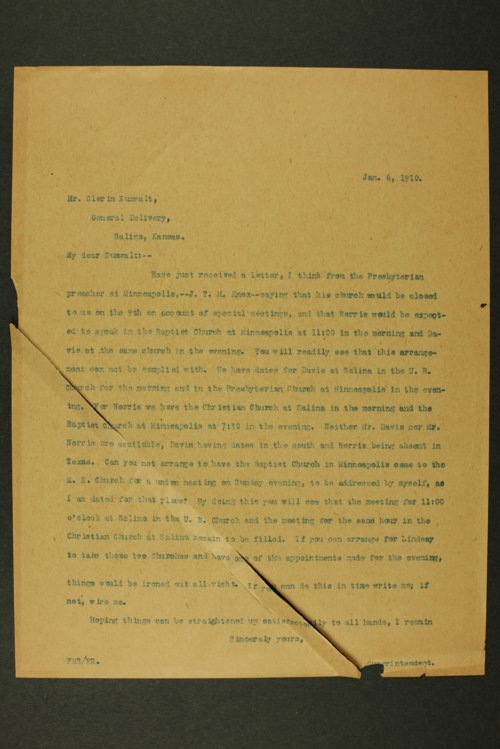 Correspondence sent and received by members of the Kansas State Temperance Union, including President Foster Dwight Coburn and Superintendent Frank M. Stahl. Correspondents include Mary Evelyn Dobbs, corresponding secretary for the Kansas Woman's Christian Temperance Union, Julian K. Codding, warden of the Kansas State Penitentiary, and representatives of the Anti-Saloon League of America. Much of the correspondence concerns efforts to advance anti-liquor agendas in local, state, and national politics. Although Kansas was the first state to adopt a constitutional amendment prohibiting the sale of intoxicating liquors in 1880, the law was largely unenforced.